Republic Services is currently in the midst of a five-year contract to serve the residents of Shenango Township for refuse and recycling collection. Republic Services provides two containers, one for refuse and one for recycling. Recycling is mandated for all Shenango Township residents by Ordinance No. 1 of 2001 and by the Pennsylvania Department of Environmental Protection. Only refuse and recycling in Republic Services wheeled carts (shown above) or Republic Services bags will be collected. Collection of refuse and recycling will be limited to contents of the Republic Services cart with lid closed or Republic Services bags. 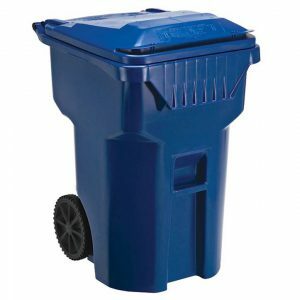 Recycling collection will be provided on an every-other-week schedule and must be in a Republic Services wheeled cart. Republic Services will collect solid waste, one bulk item, non-recyclable plastics and metals, and such other items. Items need not be in special containers, but must be set at the curb at the same location as the resident’s regular weekly trash pickup. Items must be boxed, bagged or bundled and not more than five (5) feet in length. Items placed at the curb by residents for collection must be able to be handled safely by two workers. Items deemed unacceptable, such as tires, automotive parts, dirt, televisions, liquids, basketball hoops/poles not cut down, ashes, hazardous waste and covered devices are not eligible for Spring Clean-up Week. Residents will be limited to one (1) bulk item and up to twenty (20) bags for Spring Clean-Up.